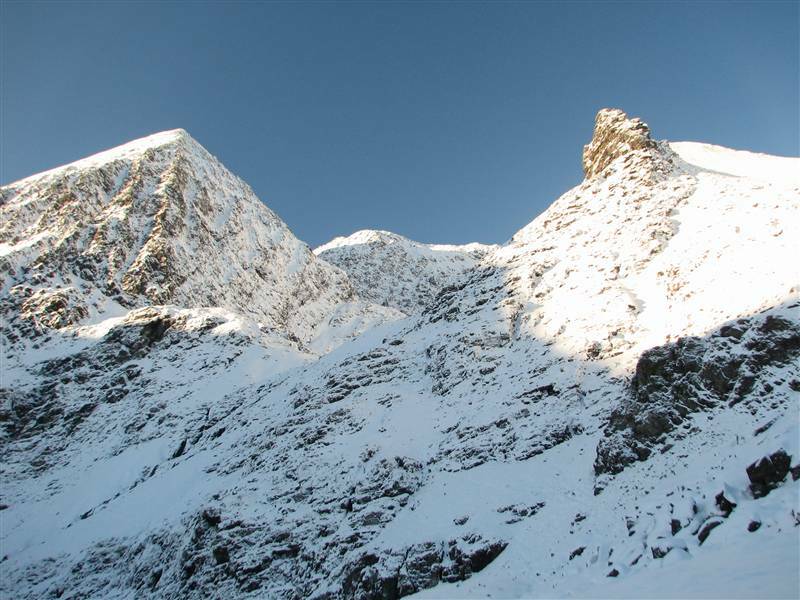 Carrauntoohil is Ireland’s highest mountain. Standing at 1039 meters it is situated in the rugged MacGillycuddy’s Reeks range of mountains, surrounded by many of Ireland’s tallest peaks featuring jagged ridges and imposing faces. 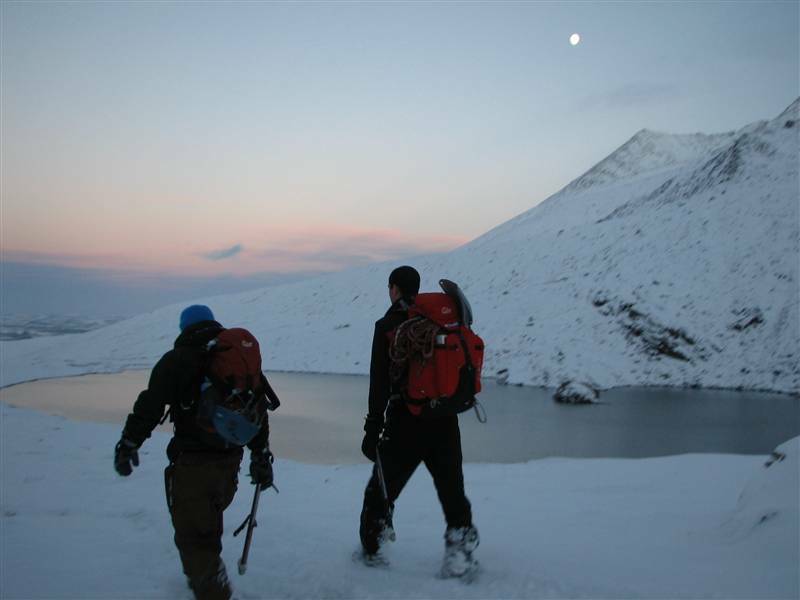 Our walk on the 18th of December was carried out in deep snow – the deepest our guide had ever seen in the area – and took from dawn ’till dusk. 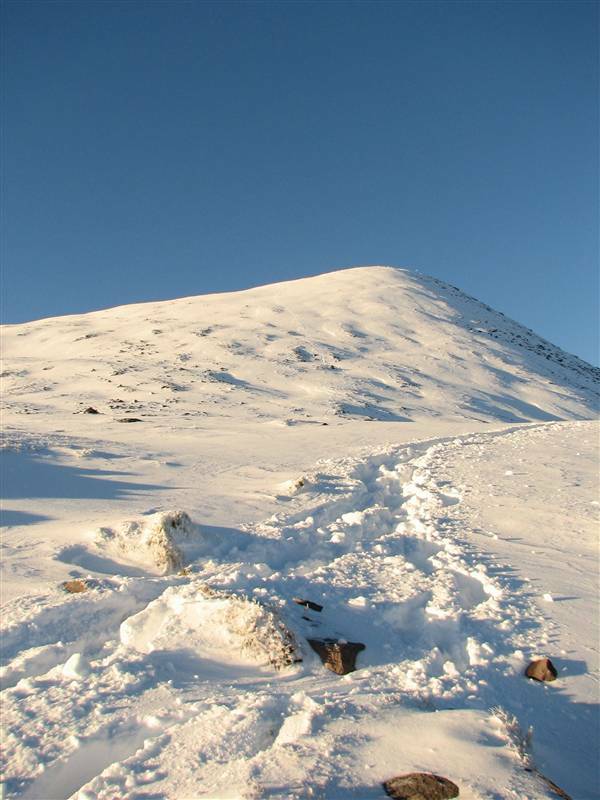 This hike would not have been recommended without an experienced guide or plenty of scrambling & winter mountaineering experience, plus the ability to navigate in white out conditions. In short, it was a tough but fantastic day in the hills that will live on in the memory. 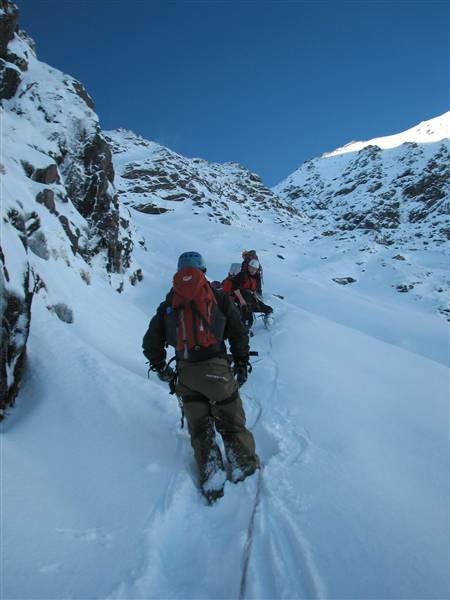 I’d always planned to get a guide when it came to tackling Carrauntoohil, primarily because I wanted to avoid the standard and much eroded Devil’s Ladder route to the summit. Instead, I wanted to bring some friends along and top Carrauntoohil by way of one of Ireland’s great walks, such as the Coomloughra horseshoe. Having a guide would mean I wouldn’t have to undertake complex route finding in places like the Beenkeeragh ridge. However I didn’t reckon on how long these routes can take and how short the days might be by the time I got around to visiting Kerry. 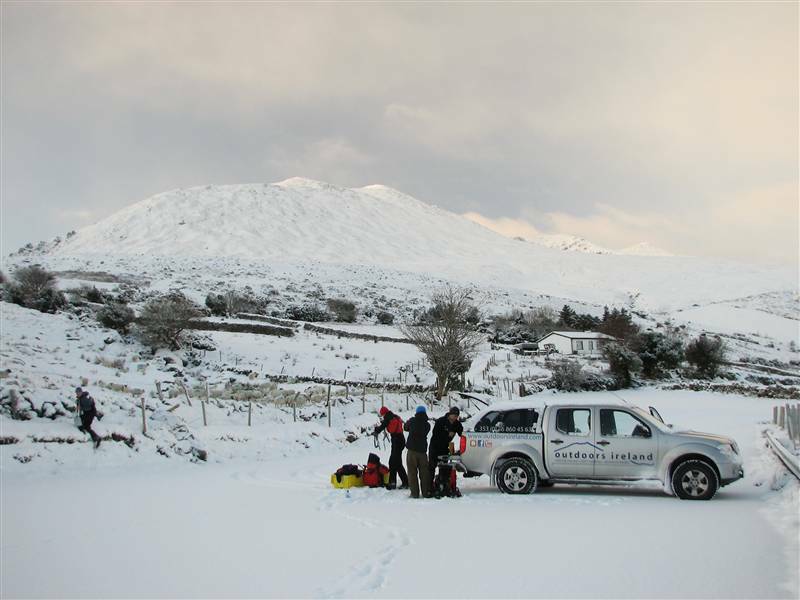 In addition, the unprecedented snowfalls of recent weeks had extended the complexity of walking high mountains like Carrauntoohil. 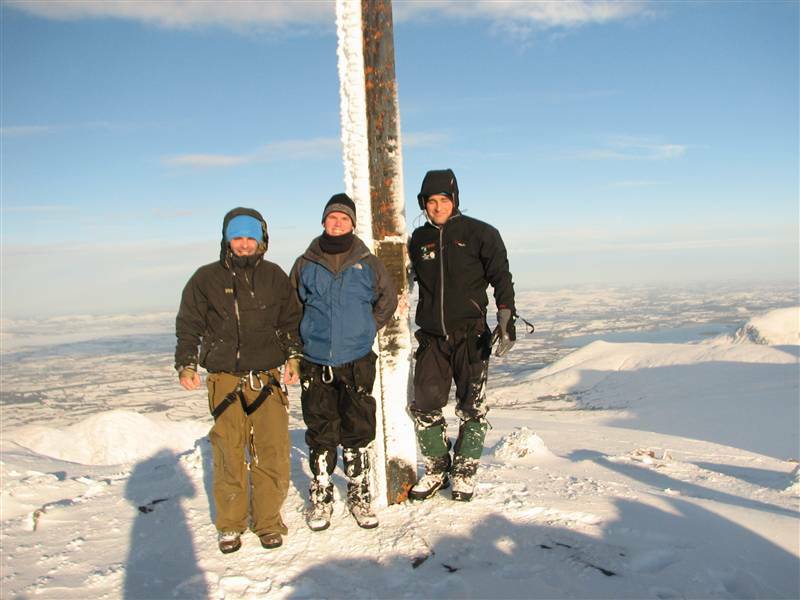 So, I was delighted to get in contact with Nathan Kingerlee of Outdoors Ireland to set a date to climb. An anxious week was spent watching the weather as airports and other transport links around Ireland and Europe started to shut down. My plan had been to drive down and finish my challenge by hitting both Carrauntoohil and Knockboy in Cork over one weekend, however it soon became apparent that driving might not be the best option, so myself and two friends chose to go by train instead. As the train passed through the country we could see that there were varying amounts of snow on the ground, with lots in Mallow and a slight sprinkling in Killarney. We checked into the Best Western Eviston hotel and went out for a mediocre italian meal before getting an early night. We arose around 7 on the saturday morning, to find Killarney under about 2 centimeters of overnight snow, not too impressive but we supposed there would be more on higher ground. 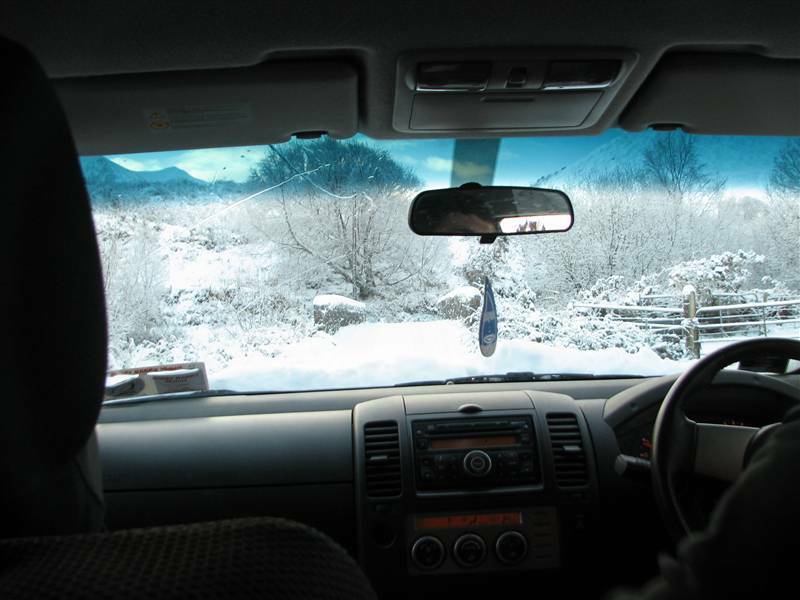 Our excitement mounted as Nathan picked us up and stuck his SUV into 4 x 4 mode as we left town and headed up the white roads towards Lisleibane and got our first glimpse of the snow-covered hills. Soon we were parked up and checking our bags for the extra hats and gloves etc. that we needed to bring along. Ice Axes and helmets were distributed, though crampons were not required. Soon enough we were on our way, not for the first time pinching ourselves at how magical the conditions were. There was about 9 inches of powder snow on the ground as we walked into the Hag’s Glen, with no wind and the promise of bright sunshine once the sun breached the valley. Our planned route was to take in Curved Gully, so we followed the faint outline of the path as it traverses and climbs above Lough Gouragh, passing below the imposing Hag’s Teeth. All the while, Nathan was telling us about local history and folklore. If he didn’t know the answer to our increasingly odd questions, he was cordially invited to make one up. After roping up we undertook some light scrambling to take us to the first level, from where we continued on up the increasingly steep ground, kicking steps in the deepening snow as we gained the second and third level. From here things got physical as we started battling against loose powder snow that had accumulated to chest deep levels in the narrow gully. Combined with the lack of crampons I found this to be a very draining part of the climb which left me with my first ever case of full leg cramps as we reached relatively easier ground. At this point Nathan decided it would be best to ascend by Brother O’Shea gully as the going was difficult in the uncompacted snow and the risk of avalanche merited consideration. This was fine by me as the gully was still tough going after all the energy I’d expended further down the hill. In time we emerged into the wind and spindrift that waited for us at the top of the gully. There were fantastic views to be had, but by this stage it was nearly 3pm and the sun was going down at 4 so we kept moving. The final pull towards the summit was again tough going at times as the ground was frozen hard and the snow scoured away by the wind, so it took effort to maintain grip. I suppose winter grade hiking boots would have helped as my regular ones just weren’t up to kicking steps into the hard ground. In any case, after around twenty minutes or so the slope eased off and we were at the summit. I was touched that the guys let me be the first to reach the cross. Judging by the footsteps only one other person had summited that day, which gave us an extra sense of achievement. Again we didn’t linger long as it was bitterly cold. I was delighted to stick on my second pair of gloves as my first pair froze solid as soon as I took them off to pour a coffee and take some photos. Now it was time to descend towards the top of the Devil’s Ladder. It was an amazing feeling to be breaking trail through waist deep snow as the sun began to set. I think we all felt so pleased with ourselves for being present to experience the day and the conditions, although the snow was so deep and comprehensive in its coverage of the land below that it actually felt entirely natural that things were that way. The Reeks are just like the Alps after all, right? 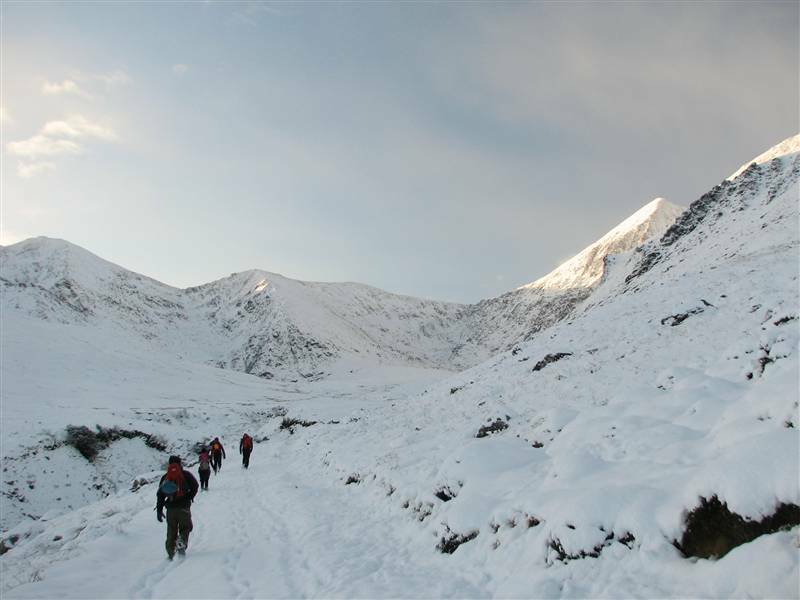 Soon we were scrambling past frozen waterfalls as we made our way down the Devil’s Ladder and into the Hag’s Glen. From here it was a pleasant 1.5 hour walk out of the valley as the light softened and the moon rose over the hills. We all agreed it had been an awesome day in the hills. I suppose we’ll have to go back now to truly realise how lucky we were to get the conditions we got that day. Our guide was Nathan Kingerlee of Outdoors Ireland. I can highly recommend him and we all appreciated his professional but friendly approach to the day, and particularly his ability to absorb 8 hours of messing from myself and my buddies. If we’re down again we’d have no hesitation looking Nathan up to plan another day’s hiking in the area. Here’s a good description of the Hag’s Glen – O’Sheas Gully – Devil’s Ladder route we took, with waypoints and a fine map to boot. 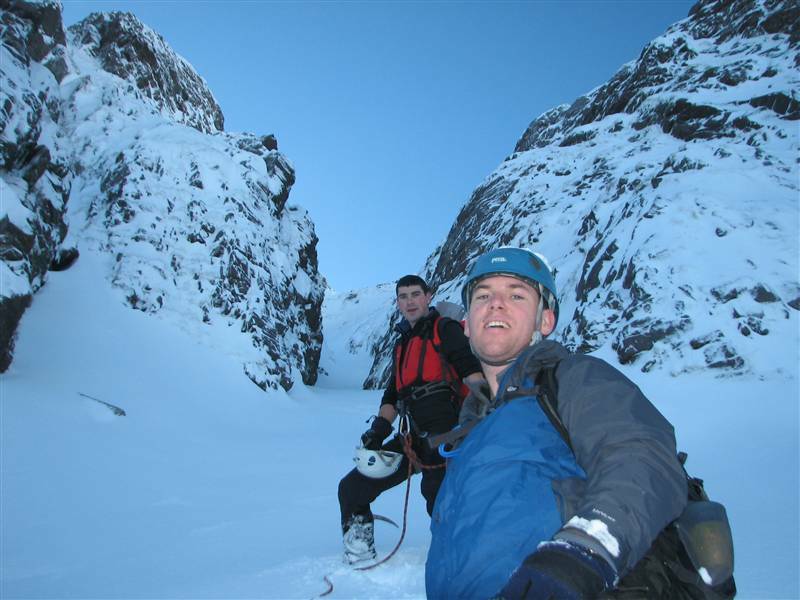 Kerry Mountain Rescue also have some brilliant route summaries for Carrauntoohil. We stayed in the Best Western Eviston house, which was well located and fine overall. The staff were great and there’s a bar – The Danny Mann – downstairs. Breakfast was so so. We ate in Chapter 40, a restaurant that provided the second highlight of the weekend. The food here was fantastic, while the service demonstrated the friendlyness we encountered everywhere we went in Killarney. If you feel like a reward after a great day in the Reeks you should definitely look this restaurant up.